Getting a new dog in your life is one of the most rewarding and spiritually fulfilling things that a person can do. However, when we’re making this decision, we need to be sure that we’re doing so responsibly. 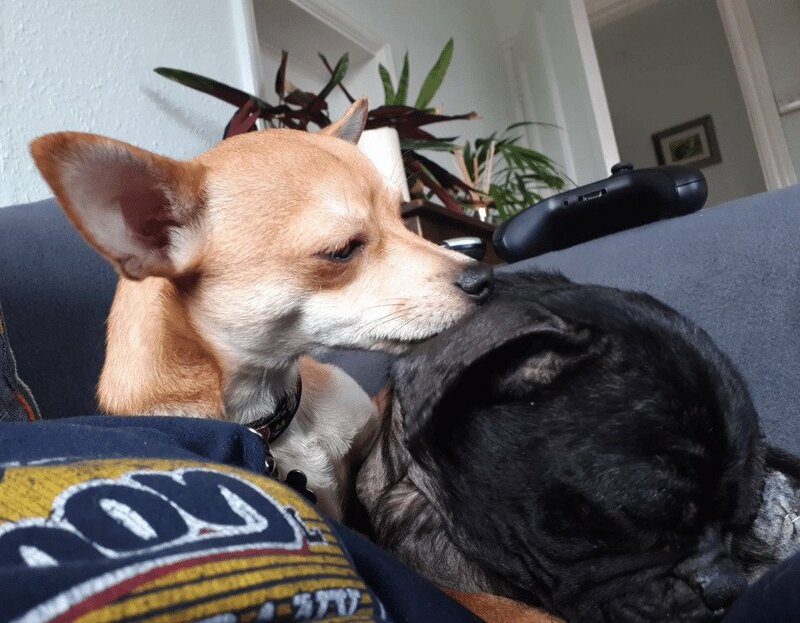 As well as making sure that your home is well-equipped enough to provide a happy home for your new canine pal, we also need to make sure that we’re not buying from an irresponsible breeder. Although a great deal of dog breeders have the highest possible standards for the welfare of their animals, there are many who are callous and neglectful, and only care about their bottom line. This was the case in a story coming of England recently. One day, a pedestrian was walking down the street in Middlesex, when a van drove by and rolled down their window. Without even bothering to stop, the driver threw a little black pug dog out into the street, then drove away. The shocked pedestrian quickly picked up the pug and checked her over to make sure she was alright. Then, they called the RSPCA, to get the poor animal that help that it needed as soon as possible. 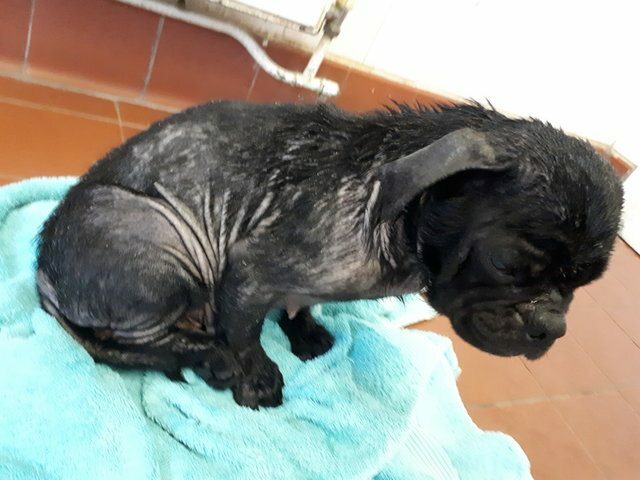 The RSPCA promptly brought the pug to a local veterinarian, where they learned she hadn’t been injured when she was thrown out of the van, but she was still in bad shape overall. The poor little pug was skinny, had missing patches of fur, and looked completely exhausted. This was because she had come from a breeding farm, where she had been forced to give birth to litter after litter of puppies until her body couldn’t handle it anymore and gave out. This speaks to what I said about callous breeders – they simply don’t care about the welfare of their dogs. 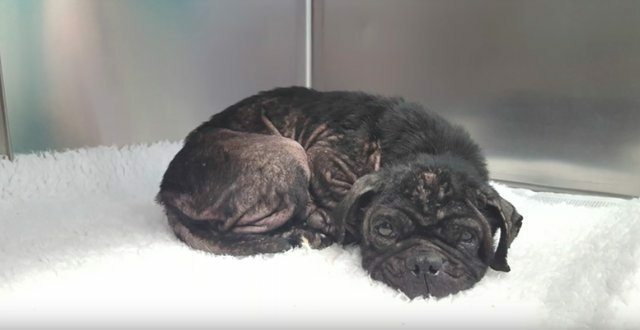 Liz Wood, the deputy manager of RSPCA’s Millbrook Animal Center, spoke about this poor dog’s neglect in a Facebook video: “We think that over time, because her skin was getting worse and worse, they decided that they didn’t want to take her to the vet or have to pay for any treatment. So I think because the skin got in such a terrible state, they decided to dump her and stop breeding from her,” she said. Understandably, the pug was scared of everything and everyone, and needed a lot of help to come out of her shell. Wood decided to bring her home and become her foster mom while she recovered from her trauma. She named the little pup Peggy. With Wood’s help, Peggy is gradually starting to become less nervous around people. She used to cower when anyone tried to touch her, but now that Wood has shown her that she’s in a safe place, she has started letting Wood pet her and hold her. You can watch Peggy’s amazing story below. She’s such a sweetheart! 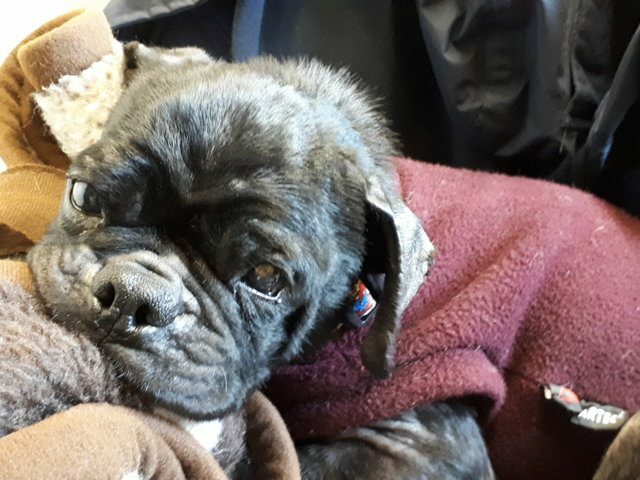 Peggy is still getting treatment for her medical issues at the RSPCA, but once she’s all better, she’ll go to her forever home. 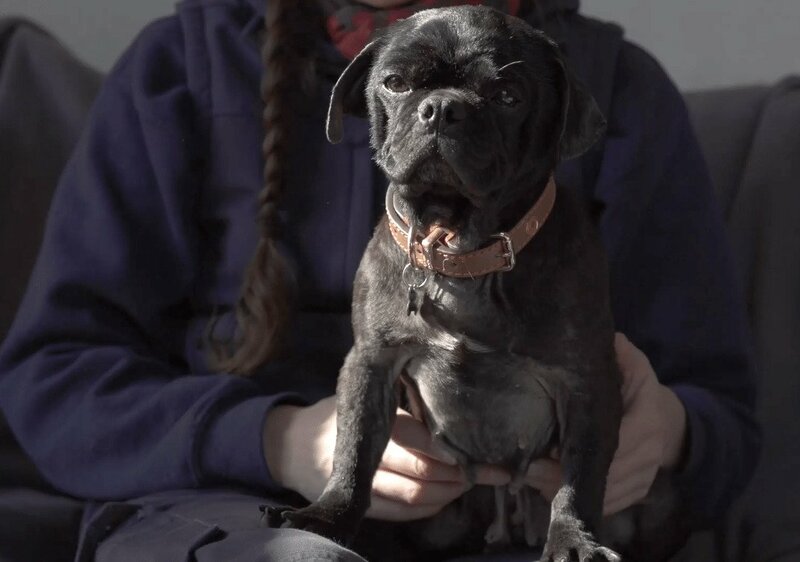 Pugs are a highly sought-after breed, and it’s not often they come up for adoption in a rescue center, so hopefully she will find the right person pretty soon. I’m glad Peggy is safe now, but as I’ve said before, there’s a special place in Hell for those who abuse dogs like this.